Well, we didn't get into the County School System for pre-K. I was completely shocked to get the letter in the mail yesterday...I thought we wouldn't find out for another month anyway. But glad to get it early enough to not lose a spot in the other school. So off we went to sign #1 up for a twice a week program at a little school close to our neighborhood. He starts in about a month. I am excited and so is he. I'm sure I'll be sad when the day gets here, but this 2 day a week thing is good because it will ease both of us into him going everyday next year. And, I get to buy one of those cute "nap mat" things we saw at Walmart last year. And I get to dust off the sewing maching to sew a cover for it. Not that he will be napping on it, mind you. Otherwise, we've had a pretty busy week. Swim lessons every day, extra swimming at our pool (where #1 was quite the fishie, to my delight), taking the boys to a $1 movie at the theater. They both sat through it pretty well. I wasn't sure how #2 would do with a movie that's not Toy Story. We didn't get there until right as it was starting so we only got 2 seats, so #2 sat in my lap and I got an hour and a half of rare snuggle time with him. It was nice. Well, I have been inspired to get my badonkadonk off the couch and start baking some stuff again. Maybe I was just in need of an occasion. I have so many cute cupcake designs from various books that are "fourth-of-July-y" to make, so instead of making them all in one design, I'm gonna do a handful of each and make a little spread of cupcakes that look like other food. I even found a cute tablecloth to put them on. Who needs protein, right?? Otherwise, I'm not really sure how we'll spend this weekend. The husband has an extra day off, so I'm sure there will be some grilling and pooling at some point. I couldn't resist a pair of flag print swim trunks for my boys the other day :) Tomorrow we are going into another city just north of here for me and #1 to run in a Fourth of July race. I love doing races, they give me a reason to run (yes, I need a reason), and they always support good causes. It's a really good variety of people that come out for all different reasons. And you usually get a ton of free stuff, especially at the bigger more well sponsored races. The only thing that irks me is when I'm in the porta-potty line before the race and some 7ft 150lb guy walks infront of me, looking all marathon-y, and I feel like he's walking in front of me all like, yeah, I'm gonna SMOKE you. But, its pretty awesome when you are coming to the finish line all huffing and puffing and there's a bunch of people who don't even know you yelling and clapping for you and telling you "Good Job! You can do it!". I wish I could bottle them up and have them follow me everywhere. Here's a preview...I made these a couple years ago to take to a Halloween party. 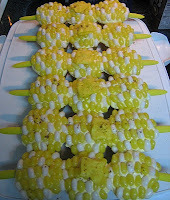 Cupcakes dressed up as corn...get it? These are from "Hello, Cupcake!". But I made them before I had the book because I saw the author doing them on Martha Stewart! What did you eat this weekend? ?